For those of you who are not familiar, Bar Bar Black Sheep comprises three specialty kitchens of Thai, Western and North Indian with a bar in a casual and laid-back coffee-shop setting. In other words, friends and families can get together to pig out on their favourite cuisine(s) and drinks in the cooler-than-your-kopitiam Bar Bar Black Sheep, and no one needs to go through the hassle of ordering from different stalls and having to dig out coins for their individual payments, given the availability of full table service and acceptance of all major credit and debit cards. While a host of imitators have sprouted up (some of them even with animal names too), Bar Bar Black Sheep remains the original pioneer of the concept, with 4 convenient locations across the island. That is exactly what we love. Whether we are feeling like Thai or we need our Butter Chicken fix, or we want both on the table, our cravings will always be satisfied hassle-free. And you know what? If you and your soccer pals are cannot watch matches without some booze and comfort food, then Bar Bar Black Sheep is made for you. Pocket-friendly prices and a mind-blowing menu of more than 150 food items, here are 10 reasons to fall in love with Bar Bar Black Sheep’s flagship outlet at Cluny Court. 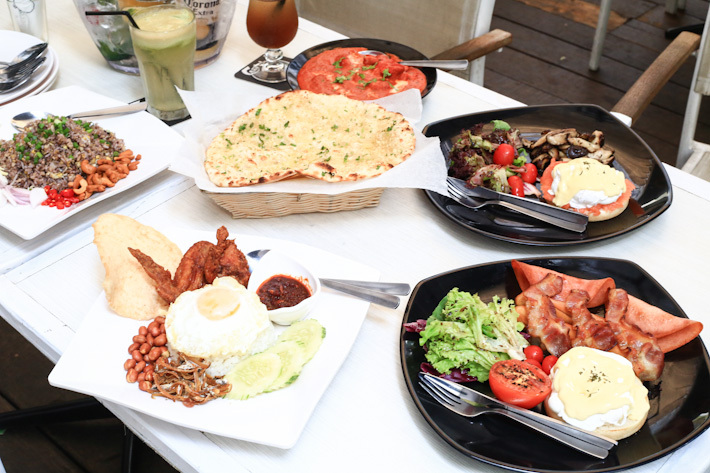 The original Bukit Timah outlet at Cherry Avenue took the local food scene by storm with its casual and chill-out coffee shop vibe, followed by the equally popular Robertson Quay and Tanjong Katong outlets. Bar Bar Black Sheep’s flagship outlet at Cluny Court, however, is the one that you should check out. Relocated from Boat Quay 1.5 years ago and spanning over 3000 sq ft, it is not only the largest shop among the four outlets, but also the only Bar Bar Black Sheep with a large air-conditioned indoor seating area. For those who prefer to sit at the outdoor alfresco deck, the cluny court outlet comes with retractable canopies, so not to worry even if it rains. Parking is also a breeze, with direct access to the carpark at Cluny Court. The team of chefs at Bar Bar Black Sheep’s specialty kitchens come from Thailand, India and renowned local European bistros, all rich in experience and present only the best. Bar Bar Black Sheep at Cluny Court has the most comprehensive food & drinks (read point no. 6) menu among the four outlets. There are more than 150 dishes on the menu to choose from, and that’s just crazily amazing! The amazing value and variety never goes out of fashion, keeping regulars coming back for more. The Northern Indian menu alone features 60 dishes. Besides the classic Indian dishes like Chicken Tandoori, Fish Tikka, Butter Chicken, Naan, and Briyani, there is also an impressive selection of vegetarian dishes. And please do not leave without trying the signature Butter Chicken. Read on; we’ve even dedicated a point to the legendary dish. If you are craving for Western food, you will face the situation of having to choose from burgers, pastas, sandwiches, as well as mains like Char Grilled Chicken (S$19.90), and Beer Battered Fish & Chips (S$16.90). Yes, we know it is not easy to choose only one. On weekends (till 3pm), look forward to Egg Benedict (S$8.90) and Full English Breakfast (S$16.90). And we kid you not when we say that the Hollandaise Sauce is rather addictive! Something that not many people know is that Bar Bar Black Sheep at Cluny Court also serves excellent local food – in fact, it is the only outlet where you can find popular local dishes on the menu. While Mee Rebus (S$10.90), Sweet & Sour Pork (S$12.90), and Curry Chicken with Rice (S$10.90) are all worth trying, the standout dish for us is the Nasi Lemak (S$12.90). It combines fragrant rice, peanuts, anchovies, egg, chicken wing, and a super addictive sambal chilli. Local delight at its best, we’d say. While the three kitchens are independently managed, Bar Bar Black Sheep has a centralised payment system which accepts cash and credit card. You can order your food from the wait staff with full table service; pay all together, and there is no GST and service charge. We all want to pledge our loyalty to somewhere that dishes out consistently good food that does not break our banks. And that is Bar Bar Black Sheep – a place that we can return to again and again. Most of the dishes are priced below S$20. Huge menu that we can go every day and order different dishes and not repeat for 3 months, quality tastes and friendly prices = we love you, Bar Bar Black Sheep. Cocktails, champagne, red wines, white wines, craft beers, and draught, Bar Bar Black Sheep at Cluny Court also carries the most extensive drink menu among the four outlets. Now, at these prices, bring on the booze! From the curries to the sauces, everything from the kitchens is made fresh daily. The Hollandaise Sauce on your Eggs Ben, the sambal chili from the Nasi Lemak, the garlic naan that you eat with your Butter Chicken… Don’t we all love such a dedicated kitchen? Get your pals and head to Bar Bar Black Sheep at Cluny Court to catch your favourite sports in action. Booze, lips-smacking good North Indian food, and live matches – it is the perfect night out with friends. If your office is in the vicinity of Bar Bar Black Sheep at Cluny Court, be sure to drop by for its set lunch that is so reasonably-priced at S$10.90 nett. Under the North Indian menu, you get vegetarian rice with Paneer and Aloo Gobi. Top up S$1 for the Chicken Tikka, Chicken Curry or Rogan Josh set. The Western set offers the choice of a salad or dessert, and for main course, choose between sandwiches or burgers. The Thai/local menu comes with classic dishes – like Tom Yum Soup, Green Curry Rice, Phad Thai, Nasi Lemak – and a dessert. Call it a “high-class” coffee shop if you must, this is the essence of Bar Bar Black Sheep – a place where you can have a variety of hearty, well-cooked food and a full bar, all at reasonable prices. Come as you are at Bar Bar Black Sheep’s flagship outlet at Cluny Court! For the latest updates, ‘like’ Bar Bar Black Sheep on Facebook. This post is brought to you by Bar Bar Black Sheep. I just spent ten glorious days in Singapore with my family. We found BaaBaaBlackSheep, Robertsons Quay just opposite our Hotel. We enjoyed several meals at BBBS, just a short stroll over the bridge. Fantastic meals, awesome staff and yummy cocktails. Highly recommend this restaurant! Very reasonably priced too!! We are from Adelaide, Australia! Wanted to try the food but when reach cluny court at 1200, it is still not open for business. so disappointed. Called them but no one pick up the call. One reason not to love it: the service. They have this awesome Polish beer at the Holland Village bar now – Polanin beer. Love it and the price is great too. This place went from an average food bar to one of the worst I have been in lately. You have to order everything at the bar yourself, either some new rule or the lazy bar staff couldn’t be bothered. Then served with a short beer, the Batman said it was on the line. No line on on the glass so now being served by lazy bone idle liars. Avoid this place at all cost. It is not worth it. By contrast the original BaR Bars further up Bukit Timah, still provides good service and pleasant staff. I will never go to Clint Cpurt Bar Bars again and am spreading the wor to all my colleagues to pass on.